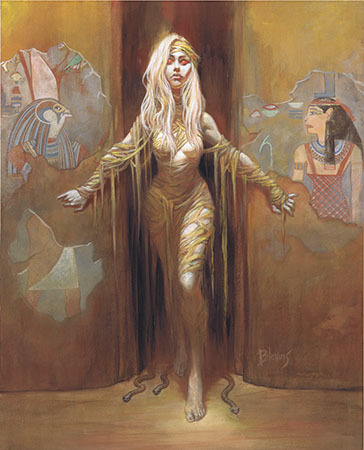 Yesterday I finished this casein painting of an extremely pale but fully fleshed mummy, just in time to deliver to my friend Jim Reid at the Big Wow Con in San Jose next weekend. I’ve posted an earlier version of this piece in the past, without the broken hieroglyphics on the wall—but now its done! Great to see your first post here Bret! Keep them coming! Love this piece, Bret. Keep it up! Great seeing you at Big Wow. You are an amazing talent. Hope to see you at a future con.